The most realistic window is actually very soon. Avengers: Endgame is officially less than two months away, and anyone who wants to have prime seats for that Thursday night showing should start monitoring ticket sales immediately. There’s no official word just yet, but we can safely assume that Avengers: Endgame tickets will go on sale sometime within the next month or so. They might even go live in the next few days. If that’s not the case, it’ll probably be April 2. Captain Marvel tickets went on sale January 7, more than two months before the film’s release on March 8. That does seem somewhat early for Marvel’s films, which usually start selling tickets around six or seven weeks before a particular film is released. But it could also be an indication that Endgame tickets might go live relatively soon following Captain Marvel’s release. Wouldn’t it make a lot of sense to sell tickets not long after the Captain Marvel post-credits scene drives Endgame hype up even more? Carol Danvers is about to shake things up. 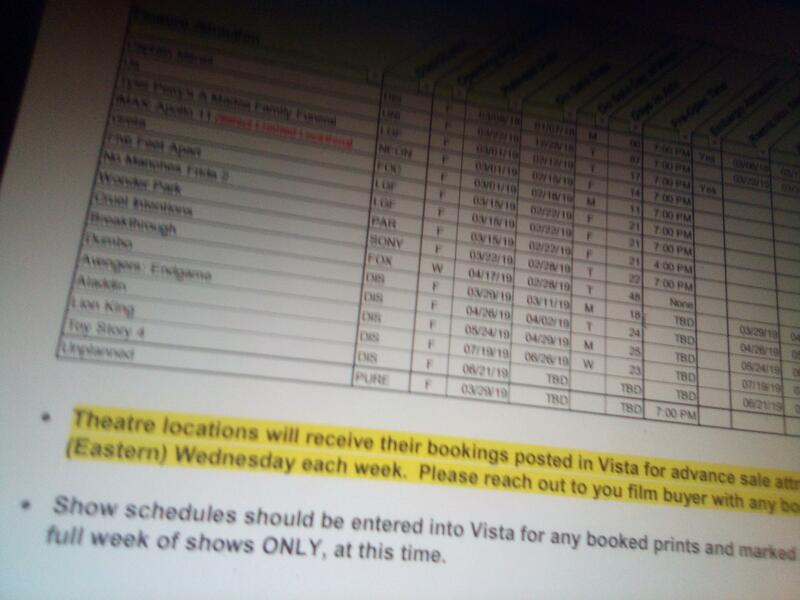 In late February, a redditor who has since deleted their account shared a blurry image of what looks like some kind of chart showing upcoming films, their release dates, and the dates their tickets go on sale. (It could be an internal schedule used by a cinema chain.) One line claims Endgame tickets go on sale April 2. On one hand, that’s dangerously close to April Fool’s Day and only three weeks before the film’s actual release, cutting it very close. Then again, that would fit into what a lot of people have called Endgame’s unorthodox marketing strategy. Also, it’s Avengers: Endgame! Disney doesn’t care when tickets go on sale because it’s bound to break box office records no matter what. For what it’s worth, the image also indicated that Wonder Park tickets would go on sale February 22, which was accurate. But this image could easily have been produced after that date. Tony Stark, do you know when 'Endgame' tickets go on sale? It seemed likely, given Marvel Studios’ history with Avengers: Infinity War, that tickets would go on sale whenever the final trailer was released, but that didn’t happen on March 14. Last March, the final Infinity War trailer was released about six weeks before the film’s release, and was used to urge fans to buy tickets right then. Marvel Studios president Kevin Feige confirmed in late February that there was at least one more Endgame trailer that would be released before the film comes out. Six weeks before the Endgame release would be March 15, just one week after Captain Marvel premieres. That seemed like the perfect time to release a trailer and announce that tickets were on sale, but Marvel Studios and the Russo Bros. simply released the new trailer on the morning of March 14 with no ticket sales announcement. Cap stands to fight in 'Avengers: Endgame'. We predict that ticket sales will either go live on Friday, March 15 or by the end of that weekend. If not, then April 2 feels like the right date — but absolutely no later than that. What’s a desperate Marvel fan to do? Most large theater chains allow you to set up alerts about when tickets for a particular film go on sale. Over at AMC.com, for instance, anyone can sign up for a free account, log in on their phone via the app, and allow push notifications. What could be better than getting a message on your phone exactly when Avengers: Endgame tickets go on sale?